It was one of those mornings when my father was taking us shooting, and as usual he’d come into our bedrooms blasting on his imaginary bugle: Ba-bup ba-ba-bup! Ba-bup ba-ba-bup! Ba-bup-ba-ba bup-bup-baaa! Colin was about 10, I was 13 and John was 15, and it was not long after John had cheesed his leg on the rusty pipe. We were still living in 91, North Avenue, Salisbury, where John had the bedroom next to us, and Colin and I slept on the veranda. That morning, John was getting dressed and I was putting on my shirt. For some reason Colin had woken up in a very bad mood, though neither of us knew why. Not that it stopped up ribbing our little brother in that typical sibling way. All that ‘shut-up, shut-up’ business that brothers always talk. ‘Oh! Shut up!’ yelled Colin and slammed the drawer shut. The ribbing subsided as John and I continued getting dressed. It was just as I was combing my hair into its dead-straight parting, that I gradually became aware of a strange cooing sound. ‘Woooo, wooo, wooo.’ It sounded a bit like a dove, but it was four o’clock in the morning, so I knew there couldn’t be any doves around yet. I looked at John and he looked at me, and we both cocked our heads to listen. ‘What on earth is that?’ I asked. Then we looked towards Colin, who was still standing, stark naked in front of his chest of drawers, but he was now slightly bent, slightly doubled up with his hands flat on top of the chest. And it slowly dawned on us that the strange cooing sound was coming from him. He was stooped over his chest of drawers, cooing like a dove. ‘Why are you making that bloody silly noise?’ asked John, and we both walked towards him. Suddenly we realised what had happened. As Colin had slammed the drawer shut, he’d trapped himself in the drawer and he was now standing stock still, completely white. 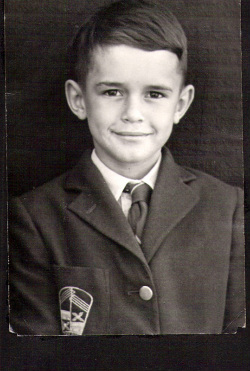 Now, Colin was quite a brown kid – he was so brown, we always thought there was a touch of the tar brush somewhere. We even used to say to Daph, ‘Come on, Mum, is there a secret in the family history?’ – because Colin was definitely darker than everybody else. But now at four o’clock in the morning, he’d gone completely white. His lips were shivering; in fact, they were slightly blue, and he was still cooing like a dove. In true brotherly fashion, John and I collapsed on the floor, laughing. Hearing our 4am-madness, Daph came up to the room to say, ‘Come on, boys, get your stuff together. Dad’s getting impatient.’ (Jock already had been up for an hour, cleaning guns and packing bags.) As she walked in, she found us collapsed on the floor rolling with laughter. We tried to speak, but we were laughing so much that we just couldn’t get any words out. Daph walked towards the cooing Colin and it was then that she saw what had happened. ‘Oh my God!’ she said, pulling open the drawer, at which Colin fell to the ground in a heap. There was blood everywhere. Daph grabbed Colin, who was still cooing. ‘Come on, sweetheart,’ she said, taking him in her arms. John and I were rolling about on the floor, laughing at the daft cooing and the bizarreness of Colin’s accident. ‘Jock, Jock!’ yelled Daph, and Jock came running into the room. She didn’t even have to say the word, we were laughing again already. Even Mum started to smile now. Yes, there was this whole smiling thing going on between us. Nowadays, Colin would’ve been taken to the doctors immediately and he’d have had sixteen, very delicate stitches sewn with a fine, fine needle – the kind they use for brain surgery. But we were going shooting and nothing was going to stop Jock. Because he’d been in the war, Jock was the most extraordinary medic. There was nothing he couldn’t fix, even his own self. If he cut his head, he’d put a bit of Vim on a scrubbing brush and scrub the wound clean. And there was always Gelonet in the house, which was a kind of netting covered in Vaseline. He’d also put Savlon onto serious wounds (which he began to use instead of iodine) because he thought Savlon was a truly remarkable thing. He’d learnt about Savlon a year earlier in 1959 when we were on holiday in Beira in Mozambique. We boys used to love going fishing with our dad, so Jock had bought us all lovely rods and spinner reels and all sorts of angling gear. One day during the holiday we were fishing for sand sharks, little creatures which could give us a hell of a fight even though they were only about two feet long. While we were spinning out from a cement groyne which lurched into the sea, I accidently cast my line across my Dad’s. I tried to step over his line but, as I did, I slipped off the groyne and slid six or seven feet down the side of the groyne into the water. I looked into the sea surrounding me and saw blood everywhere. ‘Sharks! Sharks!’ went through my head immediately, because everyone knew there were lots of sharks around Beira. As I glanced down, I realised that the whole of my leg, from my knee to my ankle, was sliced clean away. The barnacles on the groyne had opened up my leg as if on a cheese grater. I staggered out of the water, while Jock raced up the beach to Daph and sent her off to fetch the car. Then he ran back down to the sea with a towel, which he soaked in sea water and wrapped round my leg. He held me tight until Daph returned with the car. They drove me to Beira hospital, where my dad told the nurses what had happened. A big, female, Portuguese doctor led me into a room and peeled off the towel. Although dad tried to hold my face away, I could still see that my leg was a terrible mess. I’d shaved the bones on the insides of my ankle and knee, and my calf had been totally gouged. All the flesh had gone and the white bones of ankle and knee were gleaming through, with lots of pulp and fat. My stomach turned. The next day Dad drove me back to the hospital. I was taken into a room and seated on a table. The same big Portuguese doctor entered in her white coat. She took a huge pair of scissors and cut straight down the back of my bandage. She pulled the sides up and ripped the whole thing off in one go. I held onto the table for dear life, while my father nearly fainted. ‘Right,’ coughed Jock, ‘that’s enough.’ And pulling the doctor to one side, he picked me up in his arms and walked me out of the hospital. He put me in the car with my mother and said, ‘Enough is enough. We can’t do this.’ He drove us to the chemist’s in Beira and bought Gelonet and rolls of bandages along with this creamy stuff called Savlon – ‘This is the stuff!’ he declared. Back at the holiday chalet, he dressed my leg. He was so tender in his attentions: he delicately smeared on the Savlon and applied the Gelonet dressing, and then he bandaged my leg. He also gave me a shot of whisky, which in my father’s medical compendium was usually the best treatment for a 12-year-old boy. I spent the rest of the holiday with my leg all bandaged up, and throughout my recuperation, my father remained wholly attentive. He sought out heaps of plastic bags, and each day he wrapped my leg in several of them, taping them up so that I could go and paddle in the sea. Like I’ve said before, my father really could wrap anything. It just so happened that we’d been invited to lunch that day by Colonel Veitch and his wife. Colonel Veitch commanded the training camp at Nkomo, which had 30,000 acres of guinea fowl and buck, and it was one of our favourite haunts for shooting. ‘Pulled a muscle in his groin!! Ha!!! Pulled a muscle in his groin?’ shrieked John and I, as we burst out laughing. If my older brother was a commander, my younger brother was a reactionary. If there were early signs that John would go on to be a brigadier, there were also early signs that Colin would work in survival and security. ‘I’ll take a bag of biltong, a hundred-pound bag of maize meal, my pellet gun and a tent,’ replied Colin. So Dad arranged for a truck which was taking some soldiers from our barracks over to Nkomo to come via our house and pick up this 11-year-old boy. Off went Colin, out into the bhundu, where he set up his one-man camp and lived on his wits and wild life. From then on, he’d do this quite regularly. He’d go out into the middle of Nkomo and while the soldiers kept an eye on him and occasionally reported back to my parents, he was basically out there on his own. To some degree, Colin sought to emulate his older brother’s secrecy, but it never quite worked. Whereas John was never devious in any way, Colin certainly was. If there was some mischief going on, you always knew that Colin was involved in some way. He nearly burned down Llewellin Barracks once, when he set fire to acres of land and they had to send in the fire brigade. And Colin’s disasters were always bigger than anyone else’s, partly because he was always inventing things – usually weapons. Once he and a chap called Watermayer (‘Little Wart’) decided to make canons. They took a two-inch diameter pipe about twelve feet long, bashed in one end and drilled a little hole in it. They mounted this simple canon onto a wooden base. Then they made gunpowder from charcoal, sulphur, potassium permanganate and a bit of sugar. Colin had worked out the quantities needed to create the greatest possible explosion, and he and Little Wart mixed the ingredients up in a pile and they stuffed the gunpowder into their canon. Colin then got a tractor ball-bearing with an inch-and-a-half diameter and rolled it down into the canon. He then put a taper to the little hole and lit the gunpowder. The canon ball flew straight towards the garage and blew a huge hole through the brick wall. (The garage wall was twenty yards away, so the canon ball must’ve been going at a hell of a speed.) The ball sailed off into the distance – and what on earth it killed at the other end, I really don’t know. And that’s what I loved about him – my maverick younger brother. And this was the adventurous independent with whom I shared my growing up. I suppose temperamentally I was somewhere in between my two brothers: the judgement of John and the questing of Colin, mixed of course with the blows to the head and the desire to entertain. And there we were – the men-folk of our Anderson clan. At the hub of our wheel was our long-suffering mother. And oh, what times we had!